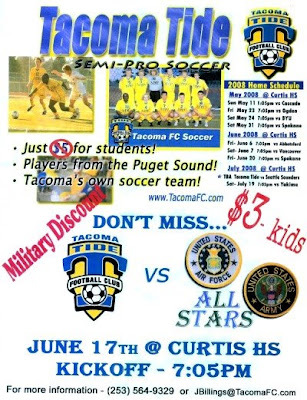 Tacoma Tide FC are reaching out to the huge Tacoma-area Military community by playing an exhibition match against the best local players from nearby Military bases. The match takes place this Tuesday night June 17 at 7:05 PM at Curtis High School. An all-star team from McChord Air Force Base and Fort Lewis will run out against the semi-pro Tacoma Tide at 7 p.m. June 17, Curtis High School stadium. Tide front office says they're hoping to get their club out there front and center in front of the many Army and Air Force soccer fans who may not know they're around. "We know they've got a lot of guys who know the game from living in Europe, or otherwise have a real affinity for it," Tide communications director Jon Billings said. Master Sgt. James Royston at McChord said a number of military players participate in the various adult leagues around the region, and a handful from the base have represented the Air Force in the in years past. That said, keeping up with the Tide's mostly college-age aspiring pros will be a challenge. The Tide stands second in the Premier Development League's eight-team Northwest division, and play home games tonight and Saturday at Curtis. Royston says he'll do some scouting. "We won't be as young as the Tacoma Tide but we've got some experienced guys," Royston said. "We're hoping to give them a run." Come welcome home the Tide from their weekend sweep in Utah and support Tacoma soccer!